Distribution and habitat: Abutilon x hybridum (Abutilon hybridum) are cultigens, not occurring in the wild. Cultivars produced by hybridising some of the South American abutilons have all been placed in one group known as Abutilon x hybridum. 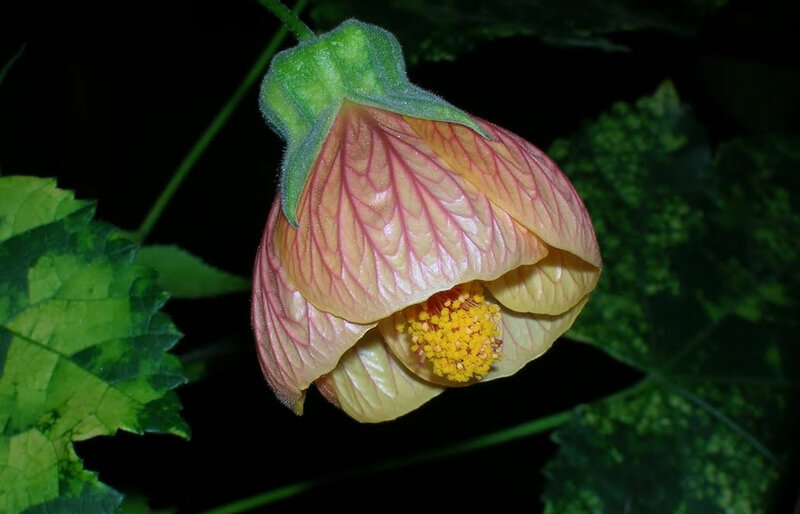 Abutilon x hybridum is a popular group of hybrids that are semi-tropical, frost-tender shrubs typically growing up to 2-3m (6-10 feet) tall in zones where can be left in the ground year-round. It is an evergreen shrubs with attractive maple-like leaves and an open, pendulous habit. Description: Abutilon hybridum is the name given to a group of hybrids of mixed parentage. The common name ‘Flowering Maple’ cames from the shape of its broad, five-lobed leaves, but it is not a true maple. It is more closely related to the Alcea species (hollyhock) and to the weed known as Abutilon theophrasti (velvet leaf). There are many named varieties of Abutilon hybridum, which can grow up to 1.5m (5 feet) spread and can start to flower while very young. The pendent blooms are usually about 5cm (2 inch) long and bell shaped with prominent orange or yellow stamens and pale green calix (the papery, bract like growth that protects the unopened flower bud). 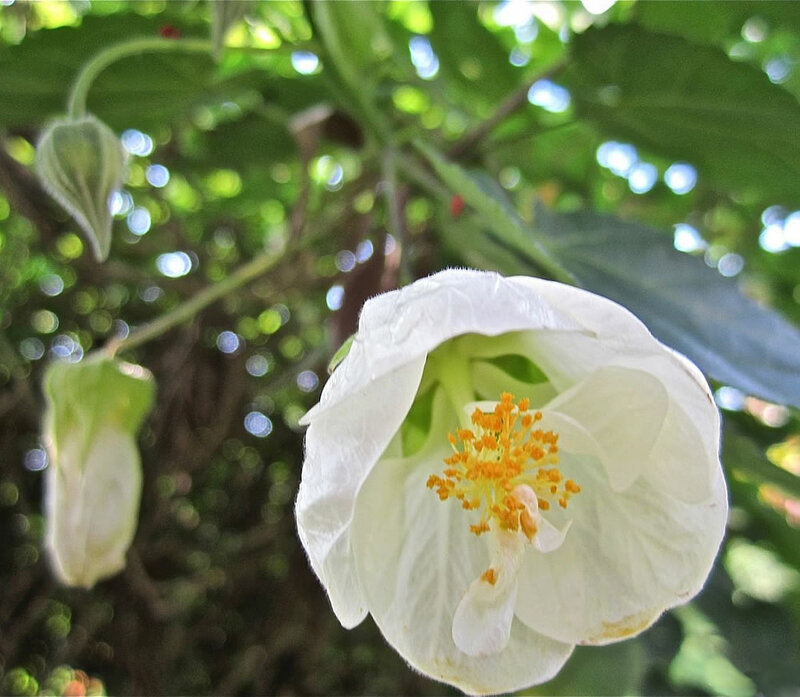 When given good light and proper care, Abutilon hybridum is producing papery blossoms on drooping stems nearly year-round. Flowers may be red, yellow, pink, orange or peach, depending on variety. Some varieties feature leaves mottled with yellow, but the strongest growers have solid green leaves. 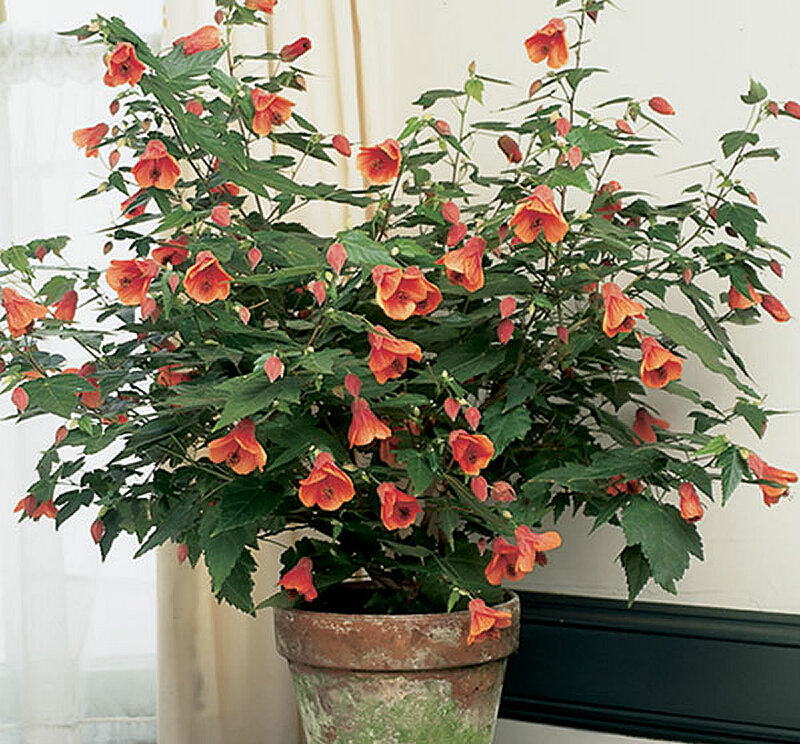 Houseplant care: Abutilon hybridum plants tend toward legginess, so it is important to prune them back by one-third their size in the spring, just before the most vigorous flush of new growth begins. Remove any thin shoots that crowd the centre and reduce other stems by one-third. Also pinch back stems occasionally through the summer to promote a full, bushy shape. 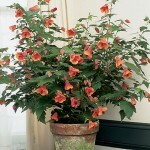 Regular pruning makes it easy to keep an Abutilon hybridum less than 45cm (18 inch) high and wide. If an upright plant is wanted to 1m (3 feet) tall, tie long branches to sturdy stakes. Abutilon hybridum benefit from being kept outdoors in filtered sun during the summer months, but must be returned indoors before frost. 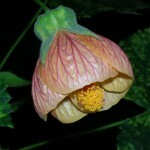 Light: Abutilon hybridum plants need bright light with at least three to four hours of direct sunlight every day. Place the plant to receive the light from a south or west window. Temperature: This plant grows well in average room temperatures 18-24°C (65-75°F) year-round. Minimum temperature is 10°C (50°F). Watering: During the active growth period water moderately, enough to moisten the potting mixture throughout, but allowing the top 1.5cm (0.5 inch) to dry out between waterings. In the rest period water only enough to keep the mixture from drying out completely. This plant needs moderate humidity. Mist foliage with room-temperature water every few days when needed, especially in winter when indoor humidity is low. This practice will help to prevent problems with spider mites. Fertiliser: Aply standard liquid fertiliser every two weeks during the active growth period only. In winter, feed monthly, as plants grow more slowly. Potting and repotting: Use a soil based potting mixture. Move plants into pots one size larger in spring. It is best to discard Abutilon hybridum after two or three years. Gardening: Abutilon hybridum plant stems tend to be weak. Pinch stem tips of younger plants to promote both bushiness and stronger, more compact plants. It can also be pruned back hard in the spring, if size control is needed. In frost zones, these plants are usually grown as annuals in the garden or in containers. 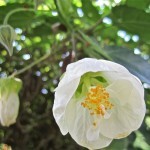 Location: A full sun position is best, but Abutilon hybridum will also flower in part shade. Best in part shade (a position where the plants receive morning sun) in hot summer climates, particularly for those cultivars with variegated foliage. Foliage may wilt in full afternoon sun. These plants will not cope so well with full shade as they need sunny spots to bloom over a long period of time (about 9 months per year or even year round). 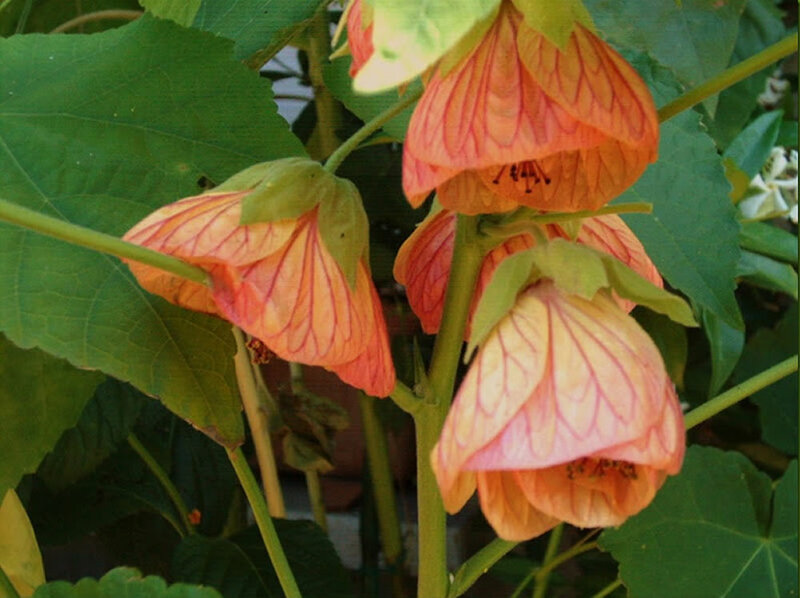 Soil: Abutilon hybridum plants like a rich, well drained soil and a cool root run. Irrigation: Water well and keep it protected with mulch. Abutilon hybridum needs consistently moist soils which do not dry out. This plant abhor dry conditions. 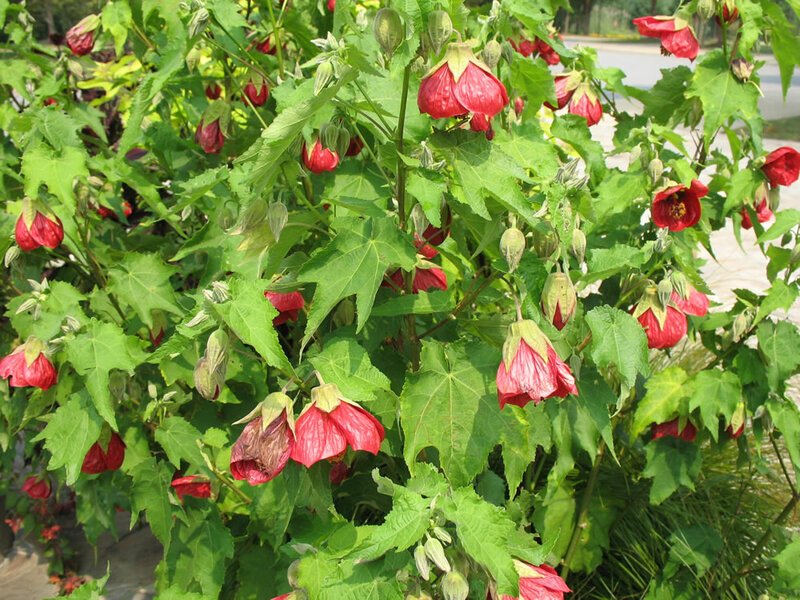 Fertilising: Avoid heavy feeding as Abutilon hybridum are inclined to produce foliage at the expense of flowers. Propagation: Take tip cuttings 8-10cm (3-4 inch) long from the plant in spring or summer, dip the cut end in hormone rooting powder, insert them in small pots in a mixture of equal parts of moistened peat moss and coarse sand or in perlite and cover each pot with a plastic bag. Place pots in filtered sunlight; cuttings will root in three to four weeks. Thereafter, move them into slightly larger pots of soil-based potting mixture, but keep the uncovered pots in filtered light for another two or three weeks and water just enough to keep the potting mixture barely moist. 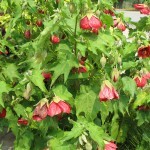 The plants can then be treated as mature Abutilon hybridum. Plant does not bloom when has not enough light or needs additional fertiliser. Treatment: Move plant to a place where it will get bright natural light half the day. Switch to a high-phosphorous fertilizer. Some plants bloom very little in winter, but vigorous hybrids should bloom year-round with good light and regular feeding. Flowers and low leaves drop when uneven watering, resulting in some roots remaining dry; also, these drops can be promoted by too much direct sun. Treatment: Rehydrate pot. In summer, move plant to a place where it will be protected from hot midday and afternoon sun. Sticky leaves can be caused by aphids; these small insects are present on leaves. Treatment: Prune plant to remove badly infested leaves. Clean thoroughly with plenty of water every 3 days for 2 weeks. Can be used insecticide soap. Leaves are pale and stippled with yellow dots and faint webbing appear on leaf undersides. The cause are the spider mites. Treatment: Isolate plant and and prune off and dispose of badly infested leaves. Clean undersides of remaining leaves with warm, soapy water. Mist daily for a week and see if plant shows signs of recovery. If plant has a stem that is not infested, attempt to propagate its tip, because seriously damaged plants may not be worth saving. To prevent an infestation of these pests it is important to provide a humid atmosphere around the plants and to spray the plants with water occasionally. 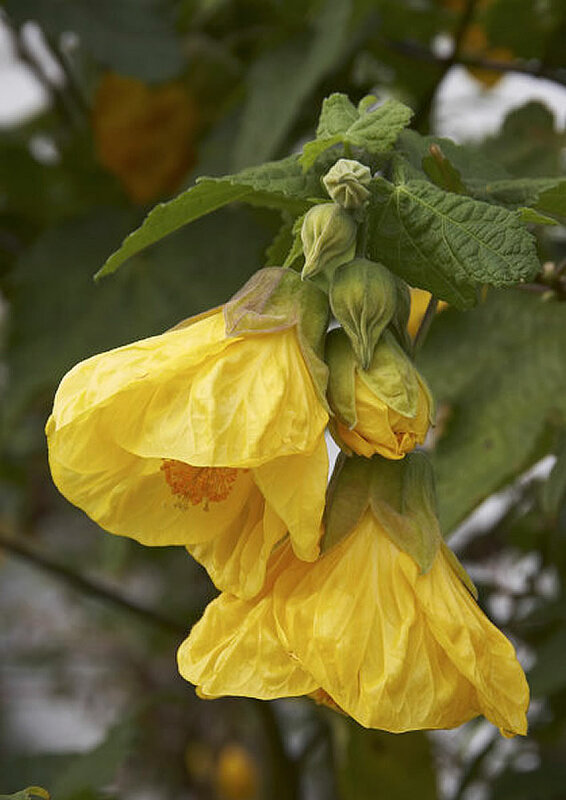 Diseases affecting Abutilon hybridum include: root rot, rust, Alternaria and Cercospora leaf spot. Treatment: These can be controlled by providing air circulation, keeping the leaves dry and using a fungicide, if necessary. There is also Abutilon mosaic virus, but the leaf discoloration or variegation is usually considered a feature. Abutilon hybridum ‘Boule de Neige’ has white flowers with striking orange stamens. 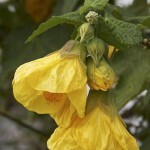 Abutilon hybridum ‘Golden Fleece’ has yellow flowers. 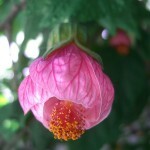 Abutilon hybridum ‘Master Hugh’ has rose-pink flowers. 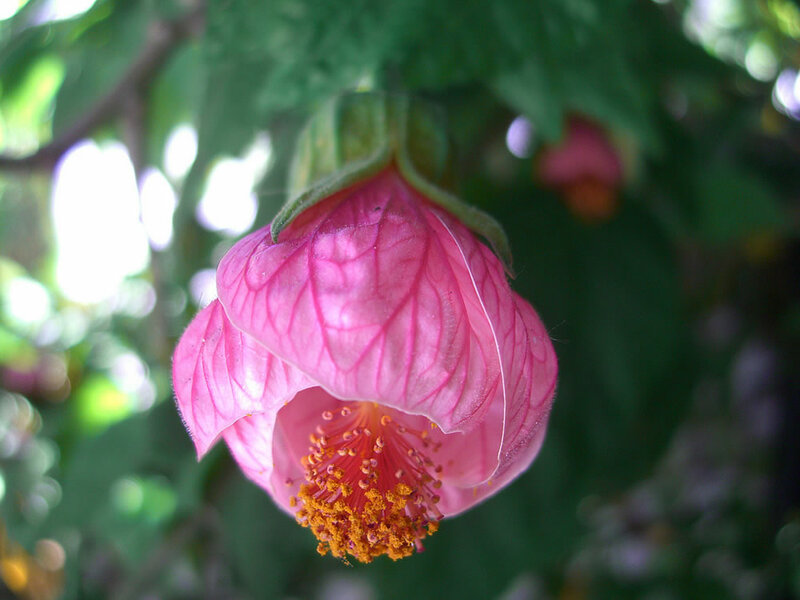 Uses and display: In addition to being grown in pots or hanging baskets, Abutilon hybridum can be trained to assume a treelike shape by tying the main stem to a sturdy stake and inching off all branches that emerge from the lowest 38cm (15 inch) of stem. It is also a beautiful addition to cottage garden, shade garden shrub border where dense screening is not required.